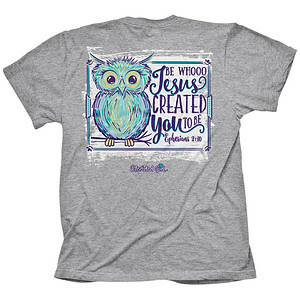 Share whooo you are in this charming “Whoo Jesus” T-Shirt in Athletic Heather by Cherished Girl®. Just like the wise and wondrous owl, every one of God’s children is uniquely feathered: a creation unlike any other. Show your colors and share your beautiful, God-given gifts with the world! Ephesians 2:10 says, “For we are God’s masterpiece. He has created us anew in Christ Jesus, so we can do the good things he planned for us long ago.” What are you especially good at? What work or hobbies would you pursue, if you only had the time? How can you use your gifts to positively impact your family, community, or the world? The activities that light up your heart are the special gifts God has given you to explore, and to share. Don’t keep your unique gifts hidden — use them as often as you can, and to bless others through good works. Share this encouraging message with everyone you know, and shine a light for Jesus when you wear this fun T-shirt. Cherished Girl Whoo Jesus T-Shirt 3XLarge was published by Kerusso in May 2018 and is our 61557th best seller. The ISBN for Cherished Girl Whoo Jesus T-Shirt 3XLarge is 612978453995. Be the first to review Cherished Girl Whoo Jesus T-Shirt 3XLarge! Got a question? No problem! Just click here to ask us about Cherished Girl Whoo Jesus T-Shirt 3XLarge.